Here it is, the official announcement for this year’s Mardi Gras celebration, Schooner style! It arrives early this year, Tuesday, February 13th. This is a very popular event and we all look forward to it. 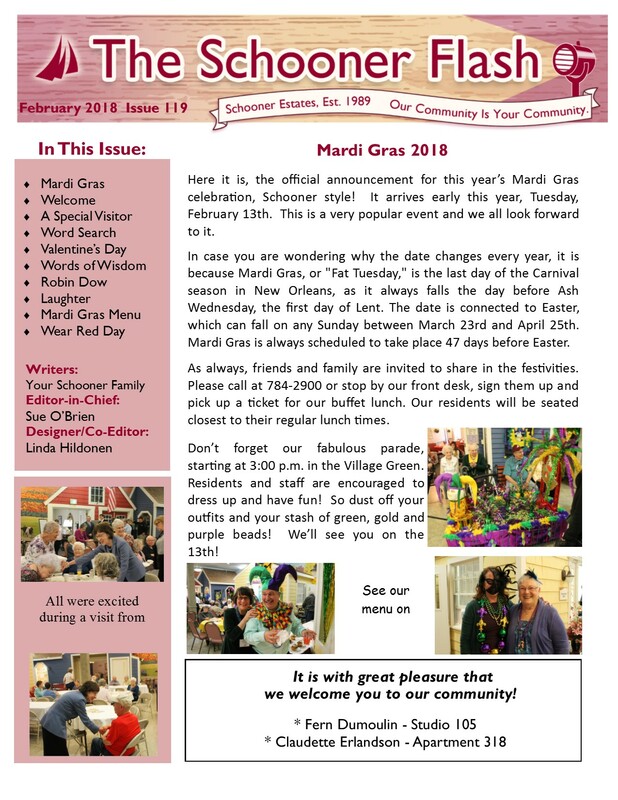 In case you are wondering why the date changes every year, it is because Mardi Gras, or “Fat Tuesday,” is the last day of the Carnival season in New Orleans, as it always falls the day before Ash Wednesday, the first day of Lent. The date is connected to Easter, which can fall on any Sunday between March 23rd and April 25th. Mardi Gras is always scheduled to take place 47 days before Easter. As always, friends and family are invited to share in the festivities. Please call at 784-2900 or stop by our front desk, sign them up and pick up a ticket for our buffet lunch. Our residents will be seated closest to their regular lunch times. Don’t forget our fabulous parade, starting at 3:00 p.m. in the Village Green. Residents and staff are encouraged to dress up and have fun! So dust off your outfits and your stash of green, gold and purple beads! We’ll see you on the 13th! 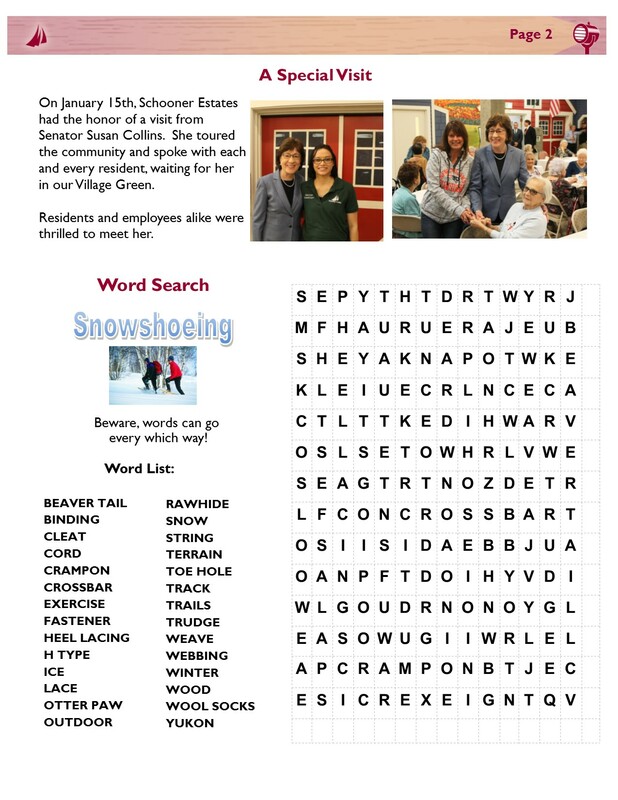 On January 15th, Schooner Estates had the honor of a visit from Senator Susan Collins. She toured the community and spoke with each and every resident, waiting for her in our Village Green. Residents and employees alike were thrilled to meet her. It’s that time of year again: candy hearts, red roses, and declarations of love all mark the February 14th celebration of St. Valentine’s Day. But while many complain that the celebration of romantic love has become too commercial, few understand the origins of the holiday. Valentine’s Day has its roots in a Lupercalia, an Ancient Roman Fertility Festival celebrated in mid-February. Involving the ritual sacrifice of a goat and many more salacious details, the practice was outlawed by the heads of the Christian Church in the fifth century, who quickly established a celebration of St. Valentine in its place. 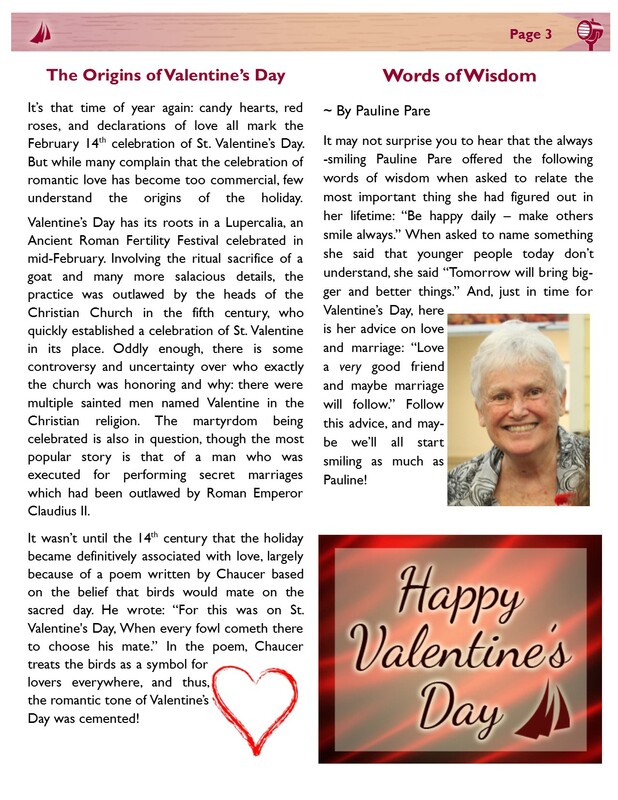 Oddly enough, there is some controversy and uncertainty over who exactly the church was honoring and why: there were multiple sainted men named Valentine in the Christian religion. The martyrdom being celebrated is also in question, though the most popular story is that of a man who was executed for performing secret marriages which had been outlawed by Roman Emperor Claudius II. It wasn’t until the 14th century that the holiday became definitively associated with love, largely because of a poem written by Chaucer based on the belief that birds would mate on the sacred day. He wrote: “For this was on St. Valentine’s Day, When every fowl cometh there to choose his mate.” In the poem, Chaucer treats the birds as a symbol for lovers everywhere, and thus, the romantic tone of Valentine’s Day was cemented! It may not surprise you to hear that the always-smiling Pauline Pare offered the following words of wisdom when asked to relate the most important thing she had figured out in her lifetime: “Be happy daily – make others smile always.” When asked to name something she said that younger people today don’t understand, she said “Tomorrow will bring bigger and better things.” And, just in time for Valentine’s Day, here is her advice on love and marriage: “Love a very good friend and maybe marriage will follow.” Follow this advice, and maybe we’ll all start smiling as much as Pauline! Robin Dow Seniors will be meeting, in our Tenants Harbor Room at 10:30 a.m. They are here every 2nd & 4th Wednesday. Visitors are always welcome. Stop by and say hello. Enjoy a cup of coffee and see what they are all about. I have heard that children laugh 400 times a day and adults laugh 15 times a day. If that is true, then somewhere along the way we lost 385 laughs a day. That’s very sad and not a laughing matter. We don’t need to lose our sense of fun, joy and humor as we age but many of us do. We all want laughter in our lives because whenever you ask someone what’s important in a mate one of the first things that they always say is a good sense of humor. Humor will get you very far in life- especially in times of trouble and despair. You have to look really deep to find the humor in some situations but if you can find it you will release chemicals in your body that will help to ease the pain. Even a simple smile releases stress by releasing endorphins. Once released these endorphins travel down the spine sending feel good messages throughout the rest of your body as they go. What or who makes you laugh and or smile? Did you know that smiling actually improves your bodies immunity by lowering levels of the stress hormone known as cortisol? 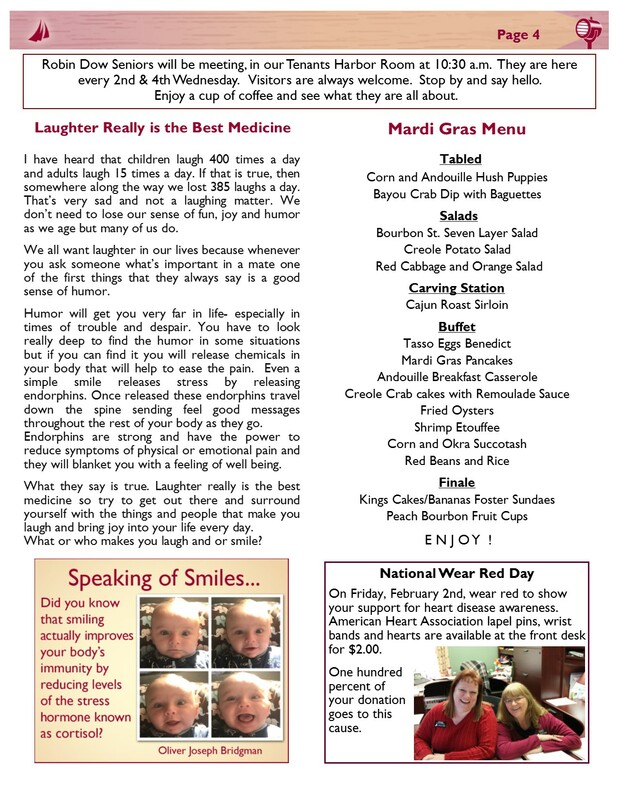 On Friday, February 2nd, wear red to show your support for heart disease awareness. American Heart Association lapel pins, wrist bands and hearts are available at the front desk for $2.00. One hundred percent of your donation goes to this cause.